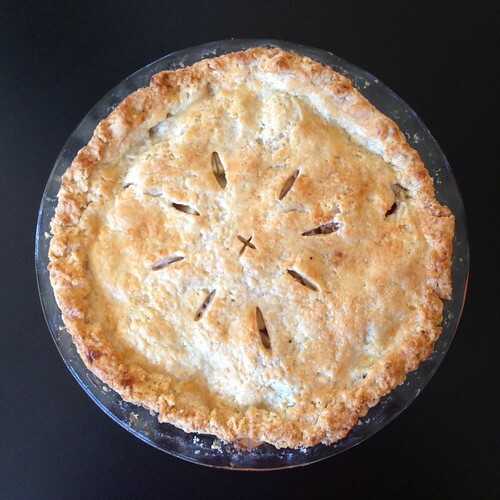 My church went apple picking last weekend, and I went with the express purpose of picking apples to make this pie. 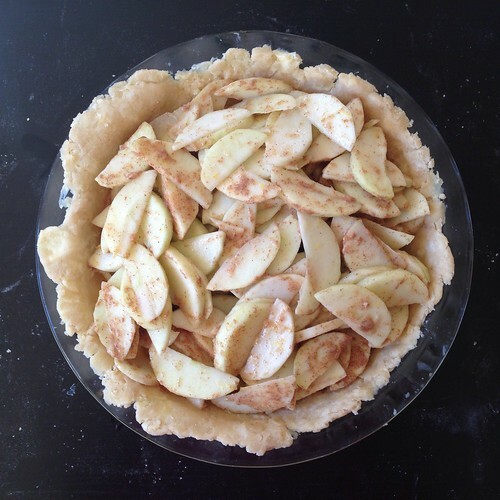 Or more precisely, so I could make this pie crust from America's Test Kitchen. I first made the vodka pie crust three years ago with Tammy. It made the flakiest, most flavorful pie crust I had ever eaten, but it uses shortening, an ingredient I don't usually have on hand. 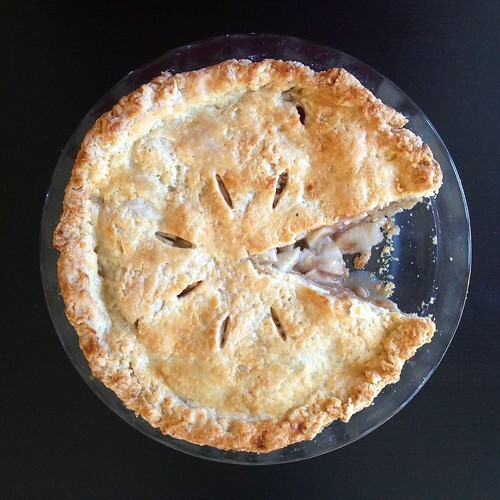 Luckily, my new roommate had some from when she made this same pie crust (it's her favorite, too!). 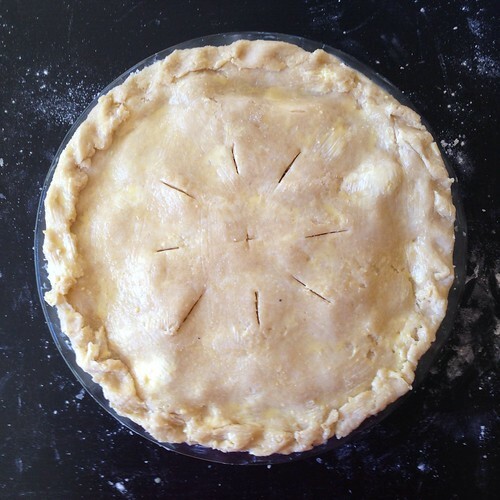 According to America's Test Kitchen, the addition of the vodka helps to keep the pie dough tender because it inhibits the formation of gluten while still acting like a binder for the dry ingredients. The shortening also helps to prevent gluten from forming because unlike butter, it doesn't contain any water. Yay, science! 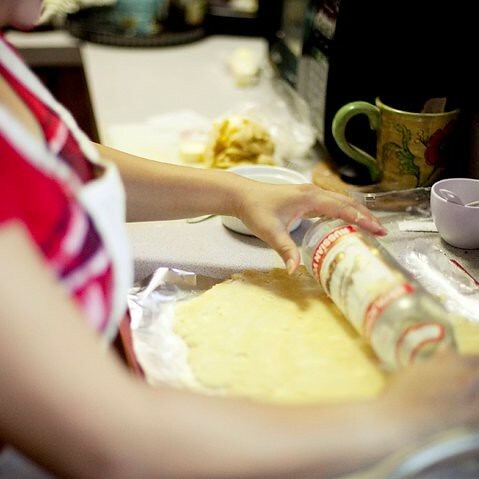 *Pro-tip: If you don't have a rolling pin, the vodka bottle works! I adapted the filling and salted caramel sauce from Sally's Baking Addiction. Sadly, I took my sugar off the heat too soon, and my sauce is more of a blond sweet butter sauce than a caramel, but it still tastes uber delicious! 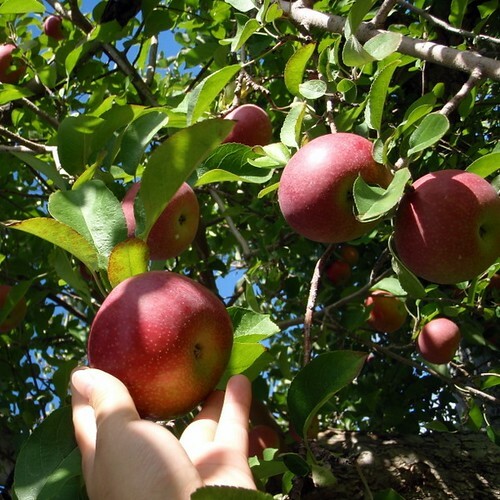 If you can, try to use a variety of apples for the pie so you have some sweet and some tart, some softer and some firmer. 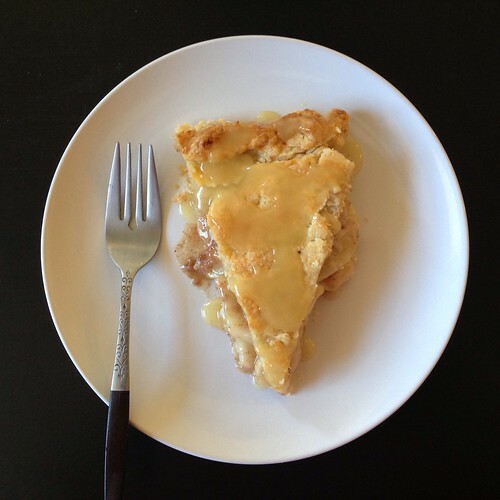 I picked Macintosh, Golden Supreme, and Honeycrisp apples for this pie. Process 1 1/2 cups flour, sugar, and salt together in food processor until combined. 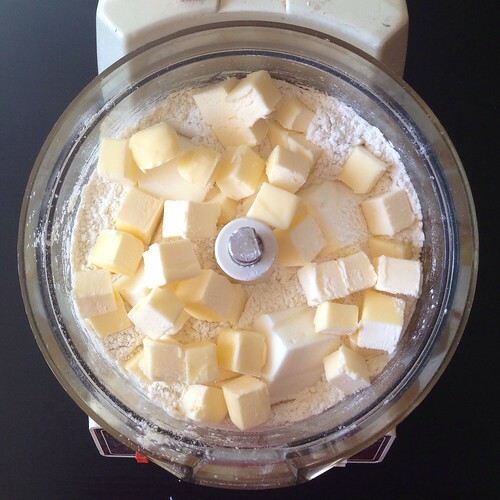 Scatter butter and shortening over top and continue to process until incorporated and mixture begins to form uneven clumps with no remaining floury bits. Sprinkle remaining 1 cup flour over dough and pulse until mixture has broken up into pieces and is evenly distributed around the bowl. 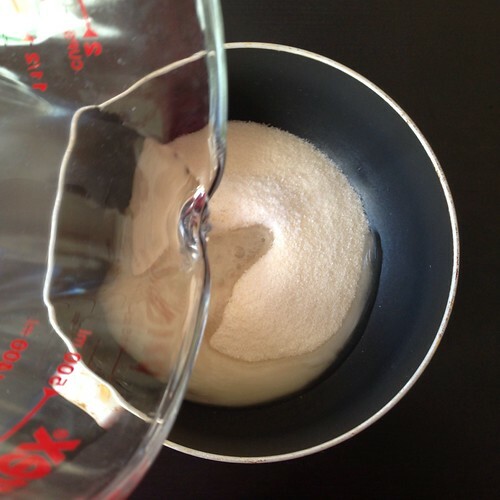 Transfer mixture to a large bowl. Sprinkle vodka and ice water over mixture. Stir and press dough together, using stiff rubber spatula, until dough sticks together. Divide dough into 2 even pieces. 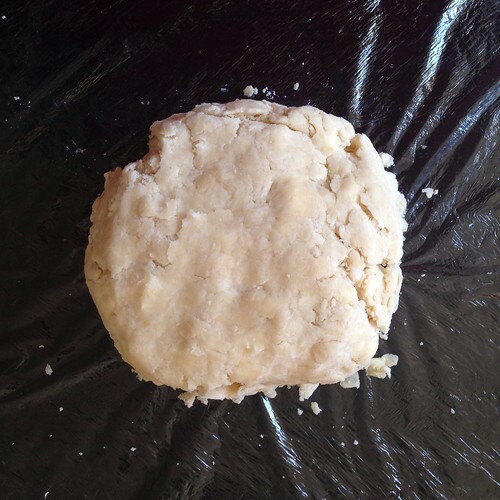 Turn each piece of dough onto a sheet of plastic wrap and flatten each into a 4-inch disk. 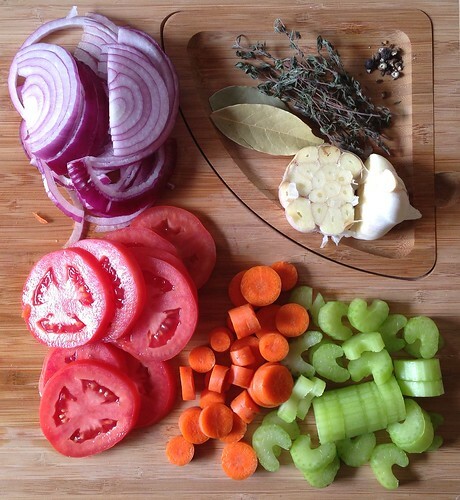 Wrap each piece tightly in plastic and refrigerate for at least 1 hour. Combine the granulated sugar, salt, and water in a medium saucepan over medium-high heat, stirring constantly, until the sugar is dissolved. Turn the heat down to medium-low and cook without stirring, until the syrup becomes a medium dark amber caramel, about 15 minutes. 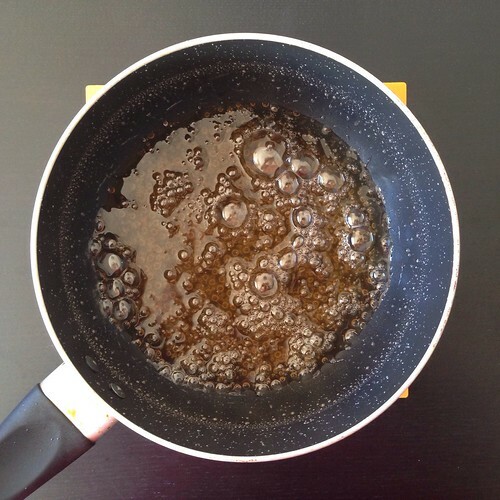 Remove the pan from heat and immediately stir in the room temperature butter and cold heavy cream. Do not worry if the butter starts to separate; it will come together as the caramel cools. 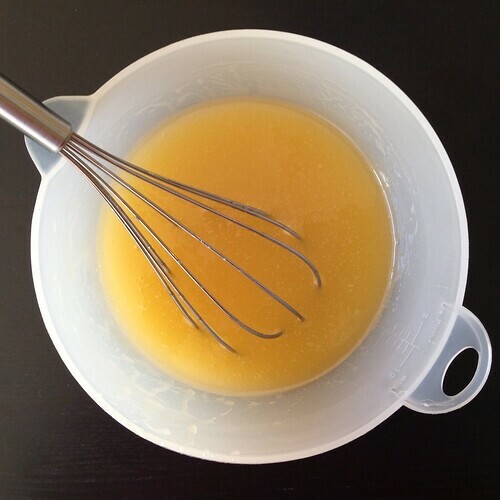 Transfer the caramel to a medium bowl and whisk until the caramel begins to come together. Set aside. Put the lemon zest and lemon juice into a very large bowl. 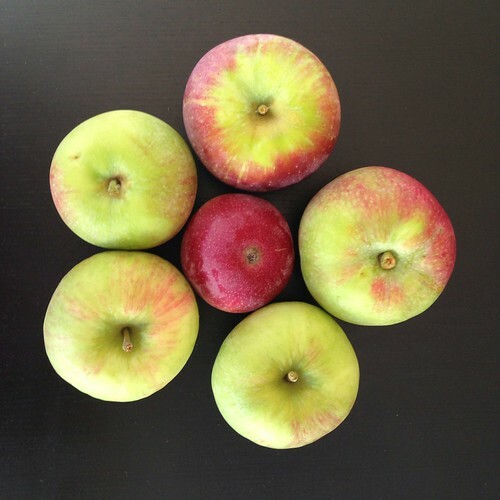 Add the apples and toss gently. 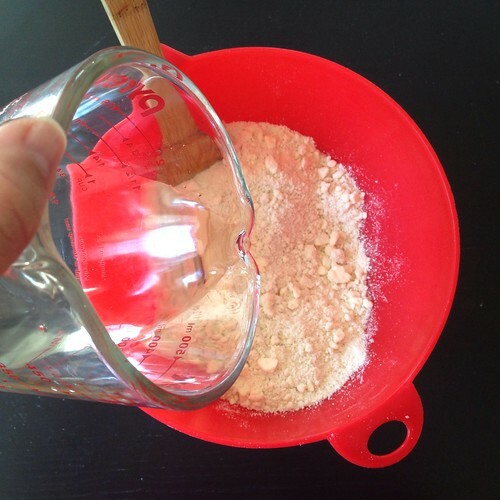 In a small mixing bowl, combine the flour, cloves, nutmeg, cinnamon, and sugar. Pour over the apples and gently toss to combine. Set aside. On a floured work surface, roll out one of the balls of chilled dough (keep the other one in the refrigerator). Turn the dough about a quarter turn after every few rolls until you have a circle about 12" in diameter. Carefully place the dough into a 9"x2" pie dish. Tuck it in with your fingers, making sure it is smooth. 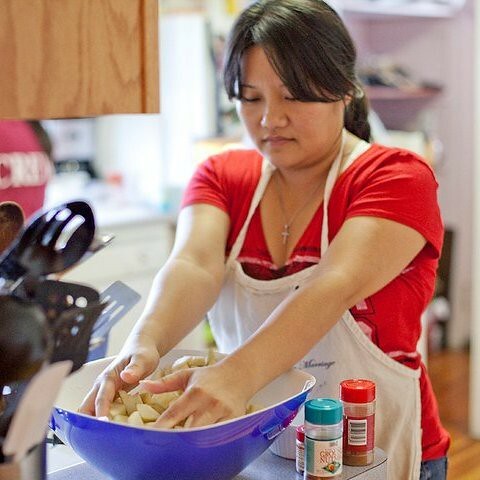 Roll out the other ball of dough to a 10" circle. Carefully place on top of the pie. Fold over any excess dough and crimp all the way around. Cut a few slits into the top with a sharp knife. Make an egg wash by beating the egg yolk with the milk. Brush the top with a very thin coating. Place the pie onto a large baking sheet and bake for 20 minutes. Keeping the pie in the oven, turn the temperature down to 350°F and bake for an additional 40-50 minutes. If the top of your pie is getting too brown, cover loosely with aluminum foil. The pie will be done when the caramel begins to bubble up. A small knife inserted inside should come out relatively clean. Allow the pie to cool for 4 hours before serving. 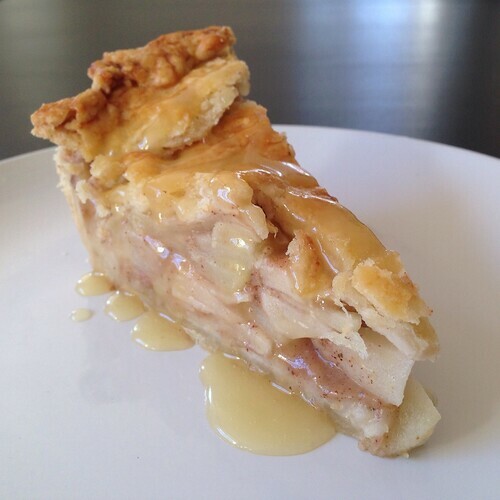 Drizzle the pie with the extra caramel sauce to serve. 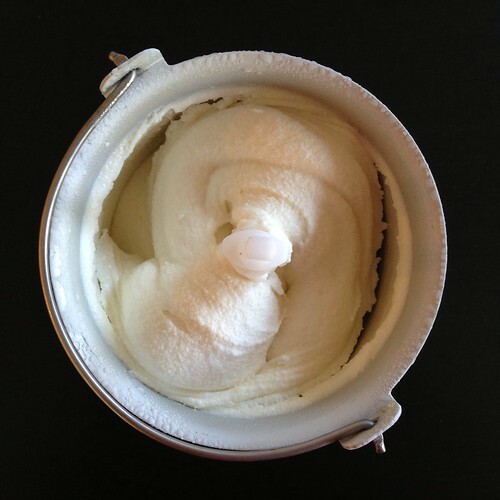 I finally got some corn in my Boston Organics delivery and knew immediately that I wanted to make this ice cream. Growing up in Ohio has its share of pros and cons, but one of the perks is being able to buy sweet corn in the summer from roadside stands. You can actually see the fields where the corn was harvested, and it's so amazingly fresh and sweet that all other corn just tastes like dust in comparison. This recipe is another one from Jeni's Splendid Ice Creams at Home, which has basically become my ice cream making bible. 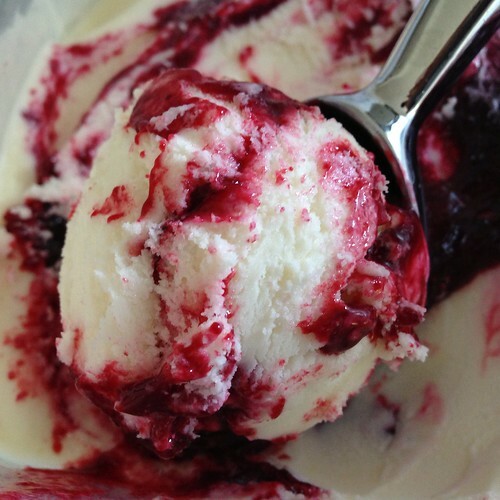 I couldn't find any black raspberries at the farmer's market or the grocery story, so I did as she suggested and made the sauce with half red raspberries and half blackberries. 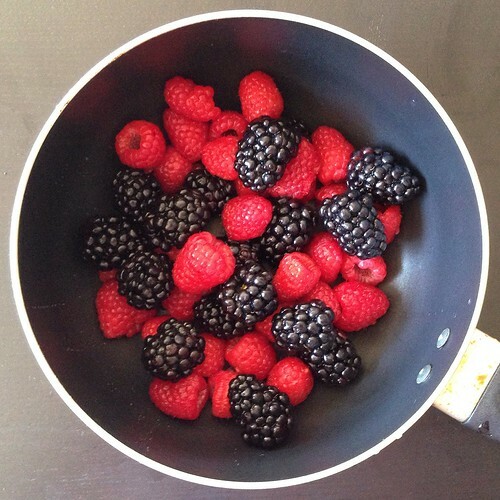 Combine berries and 1 cup sugar in a 1-quart saucepan over medium-high heat, and cook, stirring, until thickened, about 8 minutes; strain and chill. Combine the remaining milk, cream, sugar, corn syrup, corn kernels and juices in a 4-quart saucepan, bring to a rolling boil over medium-high heat, and boil for 4 minutes. 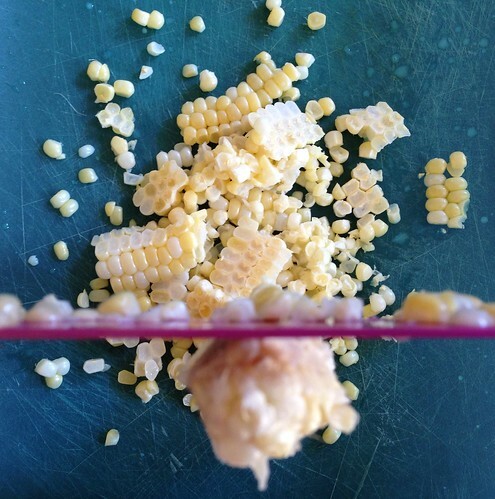 Remove from the heat and force the mixture through a sieve into a bowl, leaving the corn "cases" behind. Return the mixture to the saucepan and gradually whisk in the cornstarch slurry. Bring back to a boil over medium-high heat and cook, stirring, until thickened, about 1 minute. Remove from the heat. Gradually whisk the hot milk mixture into the cream cheese until smooth. Pour mixture into a 1-gallon Ziploc freezer bag, seal, and submerge in a bowl of ice water until chilled. 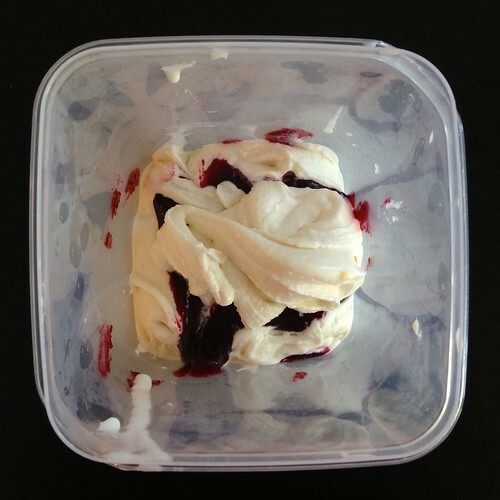 Pour mixture into an ice cream maker and spin until thick and creamy. 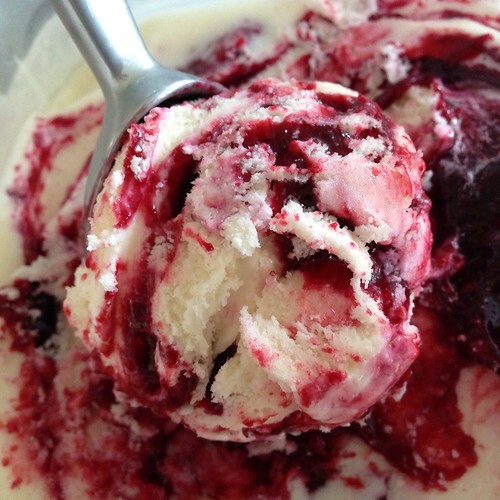 The black raspberry sauce is really yummy but may overpower the delicate flavor of the sweet corn. When I make this again I'll probably reduce the amount of sauce I layer in and increase the salt in the ice cream base a bit just to bring out the flavor of the sweet corn even more. 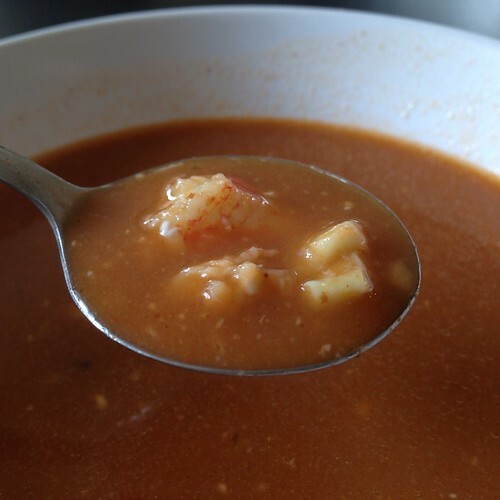 If you're going through the trouble of steaming your own lobsters, you might as well save the steaming liquid and all the juices that drip out of the lobster when you crack it open to make lobster bisque the next day. 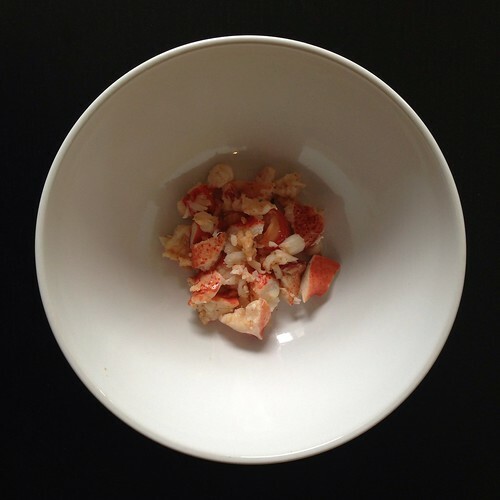 You'll also want to save all the lobster shells to make the stock with. Crack tail and claw shells over the pot you used to steam the lobsters to catch any juices and remove lobster meat. Reserve the steaming liquid and juices. 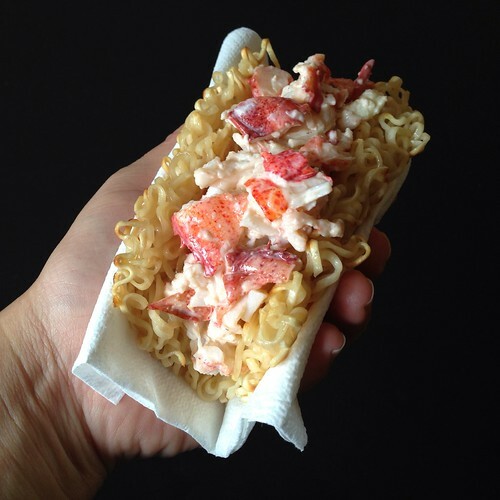 Coarsely chop lobster meat; cover and chill. 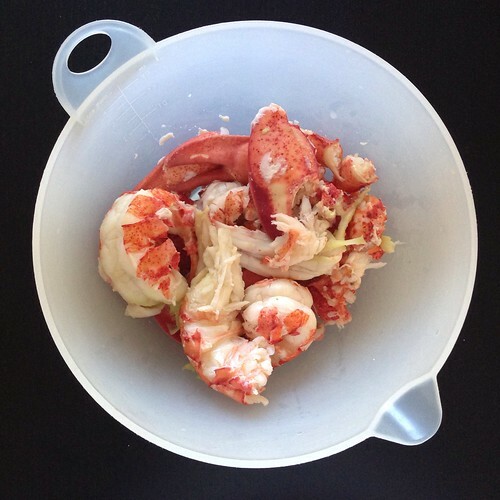 Coarsely chop lobster shells and bodies; transfer to medium bowl. Heat olive oil in heavy large pot over high heat. 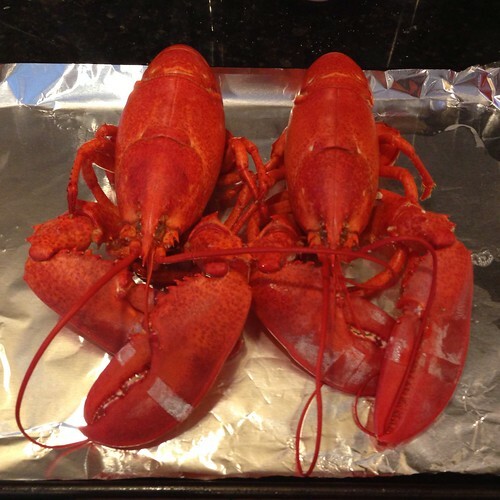 Add lobster shells and bodies and sauté until shells begin to brown, about 8 minutes. 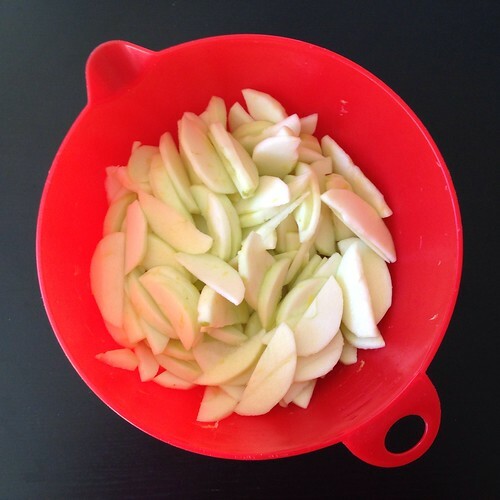 Add onion and next 8 ingredients. Boil until almost all liquid has evaporated, about 4 minutes. Add the reserved steaming liquid and lobster juices and enough water to make a total of 6 cups of liquid. Simmer 1 hour. In a separate saucepan, melt the butter over medium heat. Add the flour and whisk together. Cook until the roux turns a pale blonde. 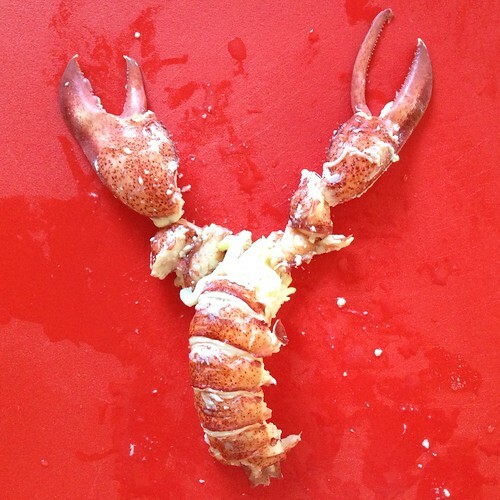 Whisk in the lobster stock and cream and bring to a boil. Continue stirring to ensure that the roux is dissolved and doesn't burn. After a few minutes the bisque should thicken slightly. 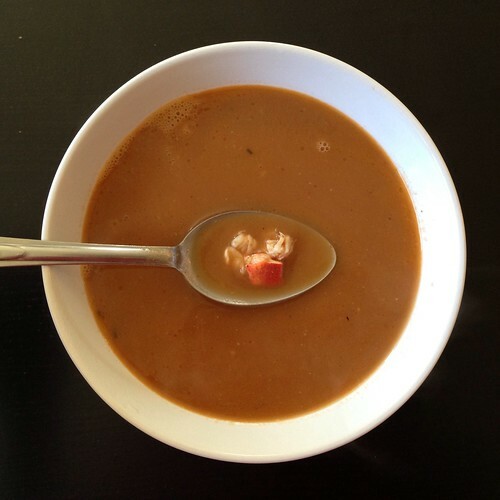 Divide the lobster meat among 6 soup bowls. Ladle in the bisque and serve hot. I was surprised at how flavorful the bisque was even though I didn't add any salt (other than the original amount I added to the steaming liquid, which was like a large pinch). I was tempted to add a drizzle of flavored oil on top, but then I realized it would only be to make the bowl more photogenic. It honestly needs absolutely nothing added to it, so I just kept it that way. 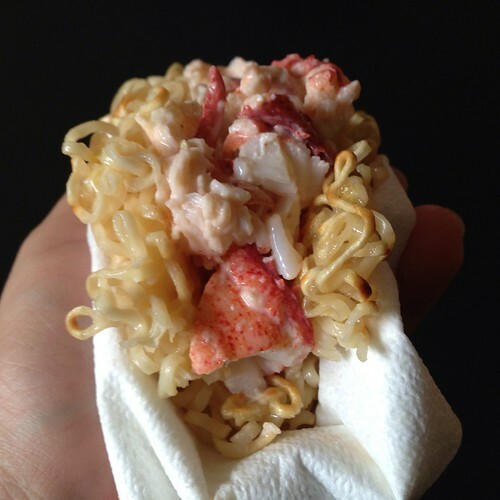 So I ended up just picking up 4 lobsters and decided to make lobster rolls instead. 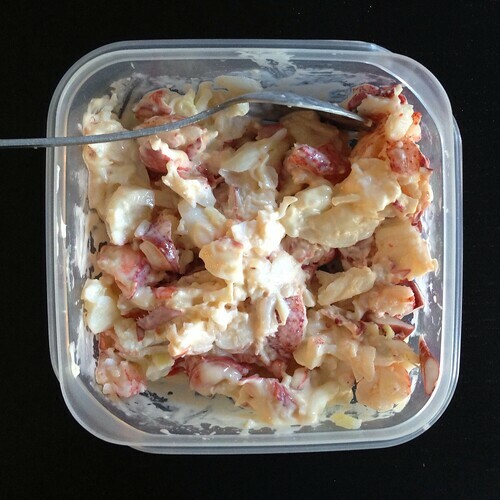 Traditionally, lobster rolls consist of lobster meat dressed with mayonnaise in a buttered top-split bun. 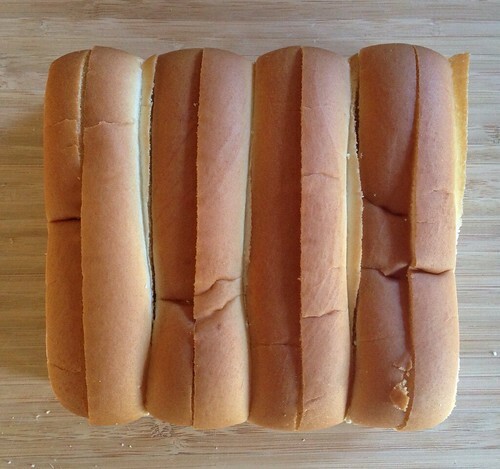 If you don't live in New England, you've probably never seen a top-split hot dog bun. When I first moved to Boston, I thought they were kind of weird and reminded me of a slice of Wonder Bread folded in half. But that was before I realized that they provide a better meat to bread ratio than regular hot dog buns and also toast up nicer. 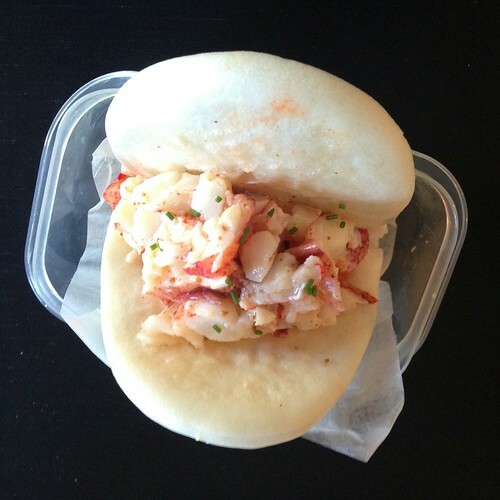 Last year I went to Portland, Maine for the first time and had the best lobster rolls in my life at the Eventide Oyster Co. Theirs is rather nontraditional in that they swap out the mayonnaise for a brown butter vinaigrette, and they serve it in a homemade steamed bun. It was soooooooo good, I had to try to recreate it! First of all, the lobster meat. 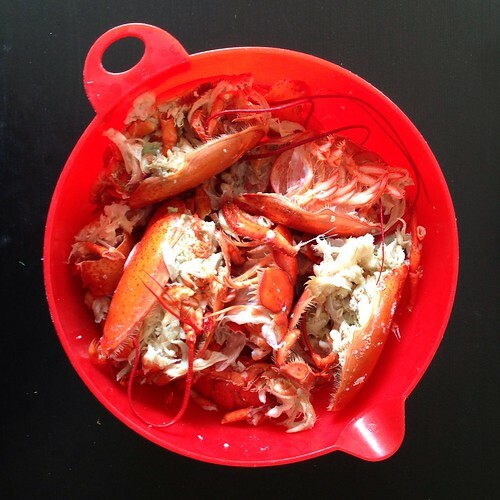 This was my first time cooking lobsters by myself, and it was not my finest moment. Lobsters already creep me out a bit because 1) they look like bugs and 2) they're still alive and moving around when you cook them. I know you can kill them by putting a knife through their head before cooking them, but I wasn't about to do that because see 1) and 2) above. And even after you kill them that way they still move around! Nope! Instead I put them in the freezer for about 20 minutes before cooking them so that they were nice and relaxed. Even then I couldn't handle touching them so I used tongs to transfer them to the pot or just slid them in from the bag. I chose to steam them rather than boil them because it takes a lot less time to bring an inch of water to boil vs. a whole pot. I followed this video to crack the lobster and extract the meat, making sure to crack the lobsters over the pot with the steaming water in order to catch all the juices. (I saved this liquid to make lobster bisque the next day.) You'll find the majority of the meat in the claws, knuckles, and tail. There's pockets of meat in the body, and you can squeeze out little tubes of meat from the legs, but that was a lot more work than I was interested in doing, so I just left the bodies for my friends to pick at if they wanted to (they wanted to). Now let's talk about the buns. 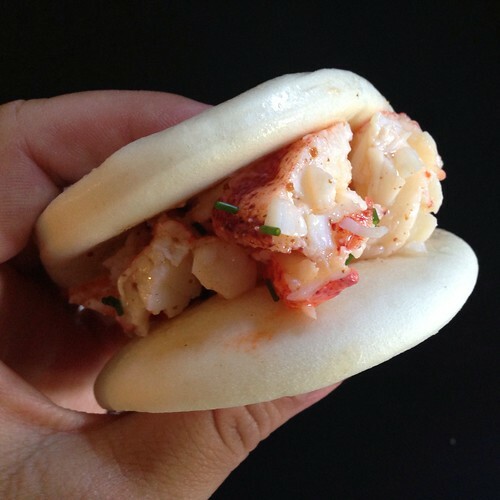 I'd recommend making them from the dough in my hua juan recipe, but if you're lucky enough to live near an Asian grocery story that sells steamed buns you can use those too. I was kind of lazy and just bought some from Super 88. I think they worked out okay, but using homemade bao buns would've been infinitely better. 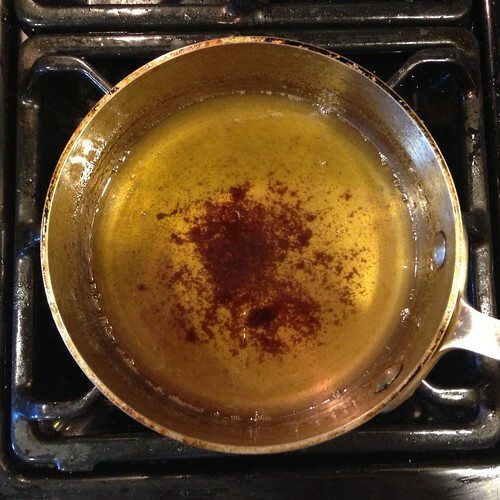 For the brown butter vinaigrette I just browned a stick of butter and added the juice from one lemon and salt to taste. Quickly sauté with the lobster meat just to heat through, top with some chopped chives, and it's ready for the steamed buns.